No, they don’t serve coffee here! “Perhaps a sign that says ‘Live Bees!’ is not the best way to get people into a winery,” I suggest to winemaker Adam Suprenant, owner of Coffee Pot Cellars. He chuckles, and notes that when people ask if he has live music he says no, but they have live…bees. 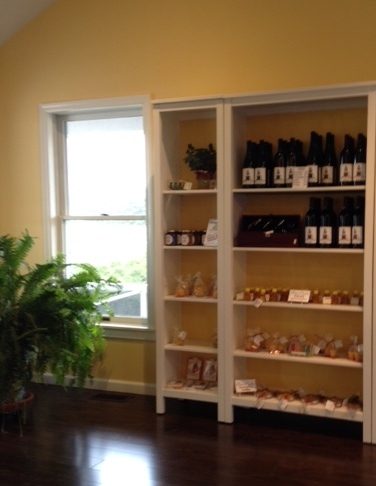 Never fear, however, the bees are behind glass, and you can observe their activity while you sip Mr. Suprenant’s lovely wines and visit with him and his charmingly chatty wife, Laura Klahre, the beekeeping owner of Blossom Meadow. A year ago when we stopped into the tasting room it had just recently opened, and we were the only ones there. This time there were several other couples, including some who were clearly regulars, and much of the discussion centered around the award Mr. Suprenant was to receive that night from Governor Andrew Cuomo for producing the best oaked chardonnay in New York State, his 2013 vintage (not available for tasting). “And I didn’t even want to make a chardonnay!” he confessed to us, but more about that later. The tasting room is a small but pleasant space that had previously housed an antique store and after that a real estate agency. 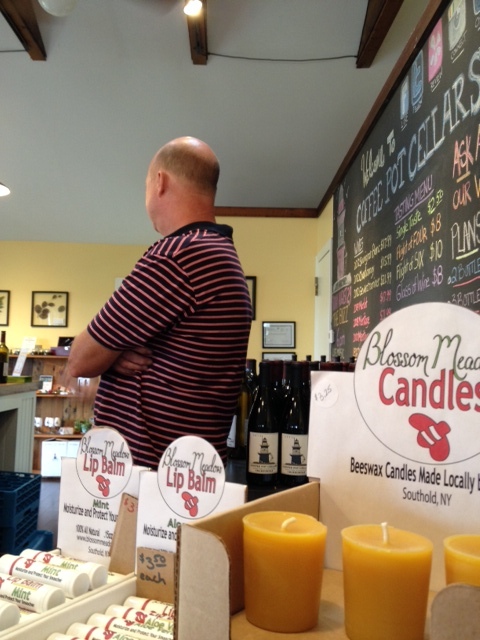 Now the simple yellow-painted space has a tasting bar and shelves filled with Blossom Meadow goods—honey, beeswax candles and crayons in various shapes, and bee-related beauty products. Last year we bought cat-shaped candles as a gift for cat lovers we were about to visit. Both Mr. Suprenant and Ms. Klahre are enthusiastic and passionate about their fields, and it is fun to chat with them both about the intricacies of bee-keeping and wine making. Did you know a bee has to visit two million flowers to make one pound of honey? 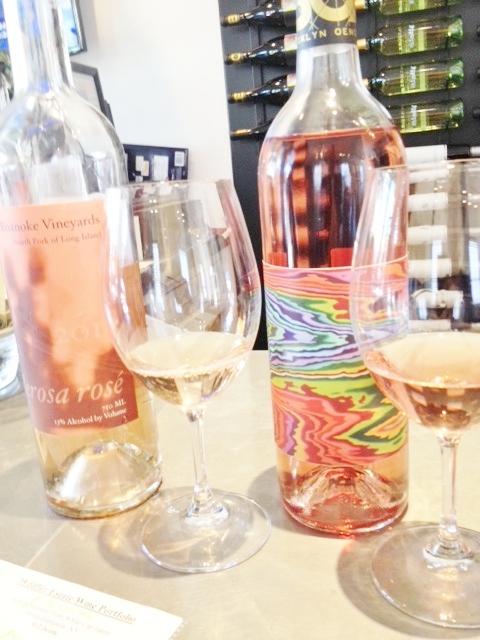 The tasting menu offers all six of their wines for $10, four for $8, or individual tastes for $2.50. We opted for two complete tastings. We sniff, and detect aromas of citrus and mineral or wet rock. The taste is tart, almost grassy, with lots of lemon. Not a wine to sip by itself, it would go well with a seafood in cream sauce dish. The labels feature the Coffee Pot light house. As we enjoy this very lightly oaked chardonnay, Mr. Suprenant tells us why he didn’t plan to make a chard. “Like a cliché?” I ask (ever the English teacher), and he agrees. But a grower from whom he buys his grapes asked him to buy some chardonnay grapes due to an oversupply, and so he gave in. Using older oak barrels, he fermented tow clones of chardonnay for only five months, and then arrested the malolactic fermentation with sulfites. “Butter cookies!” I say of the aroma, and then sip. Pineapple and what Mr. Suprenant confesses he compares to Juicy Fruit gum compose the actually very good taste. Sippable. The grapes for this wine come from Osprey’s Dominion, where Mr. Suprenant is the winemaker (He’s been a winemaker on the North Fork for 17 years.). Nice flowery honeysuckle aroma, not too sweet, with some tangerine flavor, this is also a sippable wine. A nice touch—he rinses the glasses with a bit of the merlot before we taste it. The gewürtz would overpower anything else in the glass, he notes, but I also think that sometimes when wineries rinse with water you get a taste of chlorine! Like all his wines, this is made with grapes purchased from North Fork growers, and 2009 was a notoriously bad year, with an excess of rain. However, this wine has turned out pretty good, with aromas of berry and no earthiness. Though I think I scent wet rags, my husband says pine forest. Wine tasting is not an exact science! A Bordeaux blend, this version is 69% merlot, 19% cabernet sauvignon, and 6% each petit verdot and cabernet franc, according to the tasting menu which, Ms. Klahre points out, she is proud they finally have. Complex aromas of berry, flint and a bit of smoky forest precede tastes of blackberry and herbs. Very nice, but the next is better. 2010 is known to be a good year, and this wine proves it. 59& merlot, 23% petit verdot, 14% cabernet franc, and 4% cabernet sauvignon, this Bordeaux blend really does taste like a Bordeaux. The aroma is brambly, with a hint of earth that is not present in the taste. We taste blueberry and some spice and like it so much we decide to buy two bottles for the cellar, marking them 2016. Reasons to visit: you like bees and honey and beeswax products; you enjoy talking with people about their passions; the 2012 chardonnay (and maybe the 2013), the gewürztraminer, the 2010 Meritage; Adam and Laura. P.S. 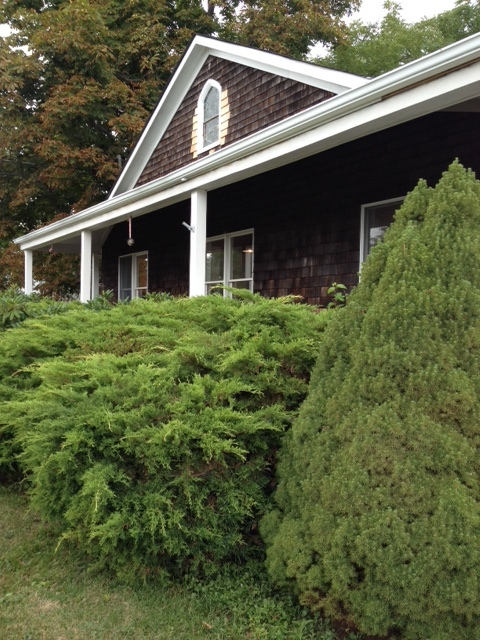 The name refers to the lighthouse at Orient Point, which is said to resemble a coffee pot. 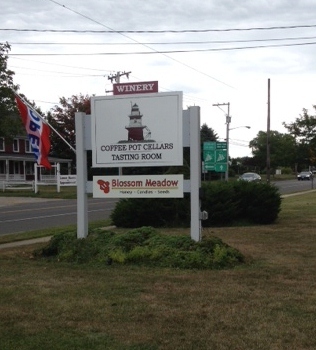 They do not, in fact, serve coffee at the winery! 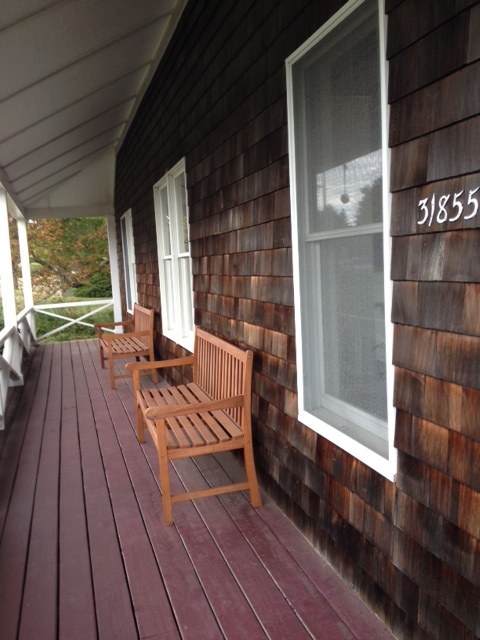 The building was originally a house, and Adam and Laura will make you feel right at home. 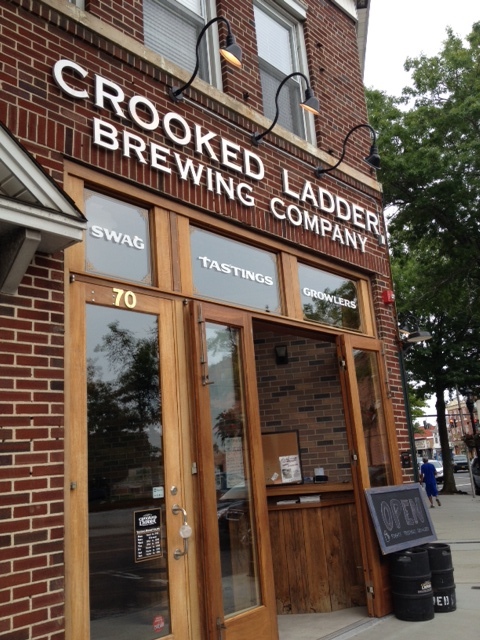 The Crooked Ladder Brewery is part of the scene on Main Street in Riverhead. Eight tastes for $9.00—and by tastes they mean about a quarter of a glass—of freshly made craft beer (plus you get to keep the glass) qualifies as a good deal in my book. 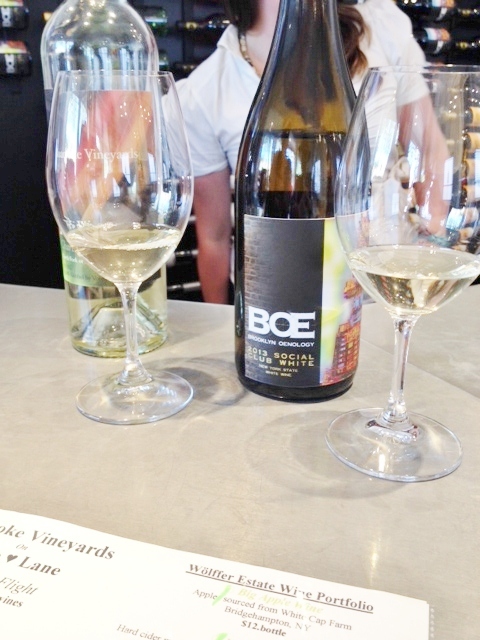 We shared one tasting, and felt we’d had plenty to drink. 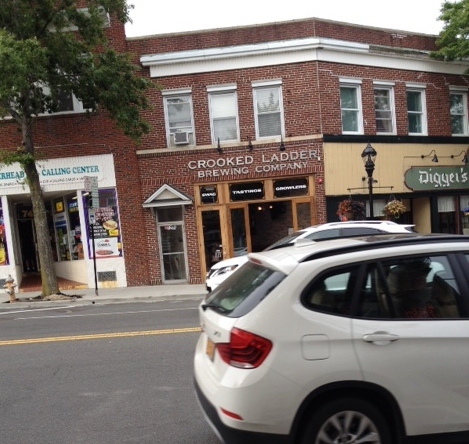 Downtown Riverhead is working hard at revitalization, with lots of interesting restaurant options, the New Suffolk Theater for live performances, and increasing numbers of formerly empty storefronts being filled, and part of that is the home of Crooked Ladder. 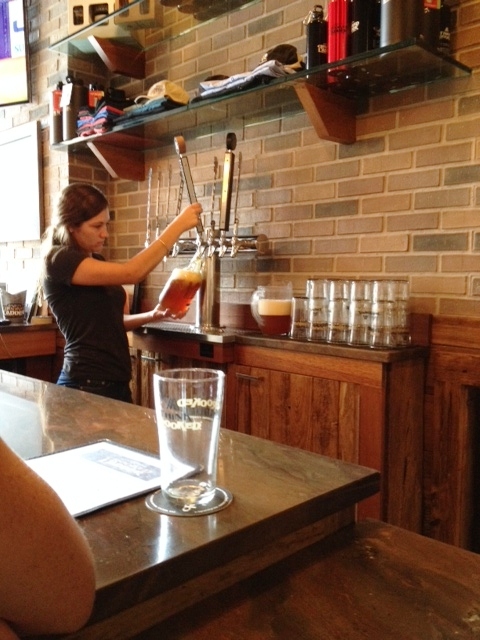 Located in a storefront on Main Street, the brewery has an attractively designed small tasting bar with stools in the front and a view of the beer making equipment in the back. You may be able to find street parking, but if not, there are free lots behind the stores on both sides of the street. When we entered we were given a menu of tastes which had information about each beer, which was fortunate as the server’s spiel was limited to, “Here’s the Kolsch.” The information included the ABV (Alcohol by Volume) and IBU (International Bittering Units) for each beer, which I’ve included in case this interests you. Though the IBU measures the bitterness contributed by the hops, it doesn’t actually tell you how bitter the beer might taste, since the taste is a function of the balance among the various ingredients. In addition to the tastes, you can also buy growlers, $20 for 64 ounces or $15 for 32 ounces, with a discount if you bring back the bottle for a refill. At the bar with us were a large group of talkative guys who asked that the TV be tuned to ESPN and a pair of women quietly doing a tasting. This is described on the menu as a German Ale, and it is a mild, fairly light beer, which would be fine on a hot day after working in the garden. We felt it was pretty tasteless, a good choice for someone who doesn’t really like beer. “Better than Coors Light, I suppose,” I said. Summeritis seems like something one would enjoy catching. Summeritis is a fitting name for another fairly light-tasting beer made with “Crystal hops.” It has a somewhat citrus/orange aroma and pleasant bitterness. Another self-explanatory name—a wheat beer brewed with the addition of 40 pounds of peaches to each batch. I don’t usually care for wheat beers, but this one is a pleasant drink, and also good to serve people who think they don’t like beer. Slightly cloudy in the glass, it has a bit of peach smell and taste. I could imagine sipping it while resting in a hammock on a hot summer day. 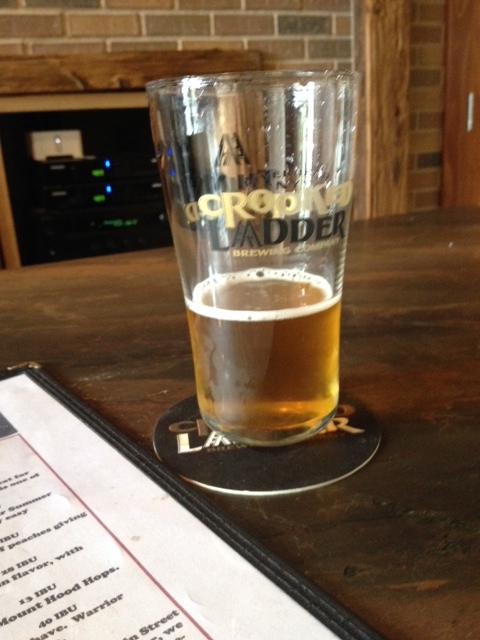 Note the faint cloudiness of the Peach Wheat–and also the generous serving! So this name begged for an explanation, which was forthcoming from our server. “It’s our flagship beer, “she told us, “the first one we made. At the time we had no permanent home, and were roaming around, doing brewing in one place, bottling in another, tasting somewhere else.” Hence Gypsy. This is my favorite so far, a tasty ale with a reddish color, an aroma of spice and cocoa powder, and a good caramel flavor that would go well with burgers. 5. Scottish Ale 6% ABV, 13 IBU Scottish style ale (duh), this is a dark beer with an almost meaty smell and smoky taste that would complement barbeque really well. It’s about this point that we notice that the server is rinsing our glass after every taste, using a neat device next to the taps that delivers a quick fountain of water to the inverted glass. Why Four Day Weekend? No idea, said the server. 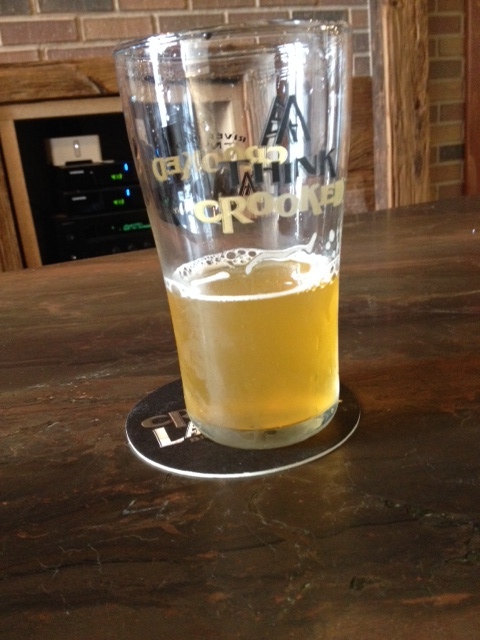 This is described as an American Pale Ale, using Warrior, Simcoe, and Citra hops—and it is hoppy. Now this one I really like. I think it would be good with almost anything. The aroma is somewhat flinty—wet iron I say—with an unusual and complex flavor. 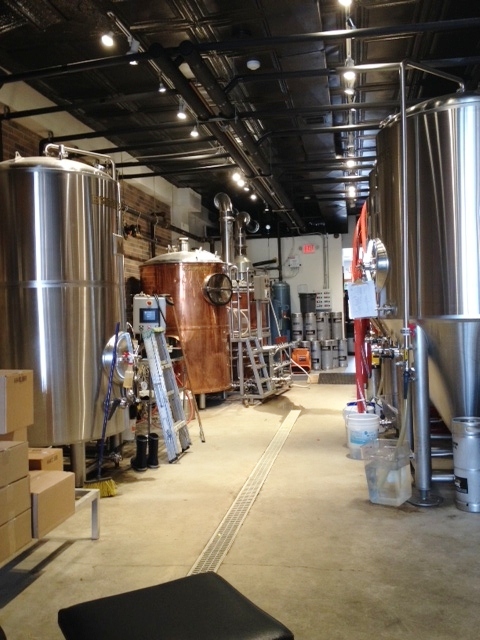 Since the brewery is located at 70 West Main Street, the genesis of this name is fairly evident. The notes inform us that four different varieties of hops go into this beer, plus some dry hops for another element. Good balance of bitterness and flavor, this is another beer I could see buying. Certainly we like it better than any beers at Long Ireland Brewery. I tend to prefer dark beers, like this porter. Named for a bridge that spans Shinnecock Bay, this porter transports us to an English pub. If you like a dark beer, this is the one for you, with its tastes of somewhat sugary coffee balancing the bitterness of the hops. 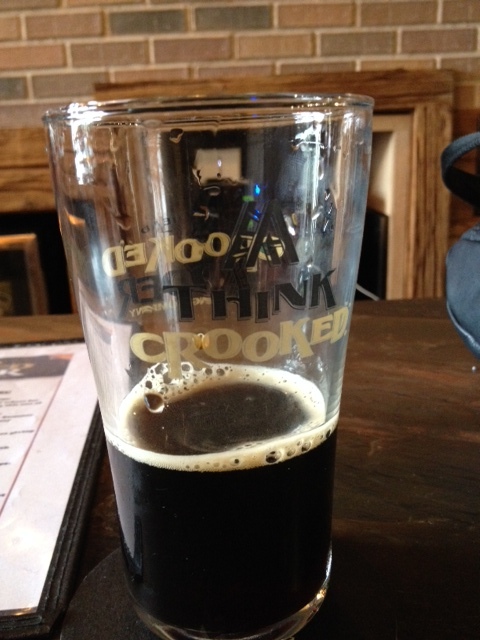 Though I prefer Greenport Harbor’s Black Duck Porter, this one is also quite good. Reasons to visit: you like craft beer; you’re interested in walking around Riverhead to see the progress that has been made in its revitalization; you have some time to kill before dinner or after lunch at one of Riverhead’s restaurants (We’re especially fond of the bison dishes at Tweed’s.) or after a visit to the Farmer’s Market on Saturday; the Gypsy Red, Four Day Weekend APA, 70 West IPA, and Ponquogue Porter. Note that during the week they may be closed or may not open until 3 PM, so check the hours before you go. 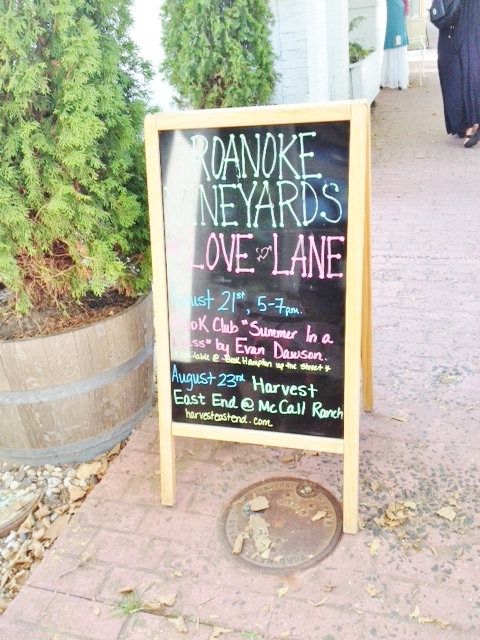 “Wow, that was fun,” we agreed, as we left the Roanoke Vineyards Tasting Bar on Love Lane in Mattituck. We had arrived about 3:30, not knowing that a pop-up event was about to happen, pairing Roanoke wines with wines made by Brooklyn Oenology (BOE). Though the event was due to start at 4, we were able to do the tasting early, and, because the room was fairly calm at the moment, we had lots of attention from Roanoke’s Robin and BOE winemaker Alie Shaper. 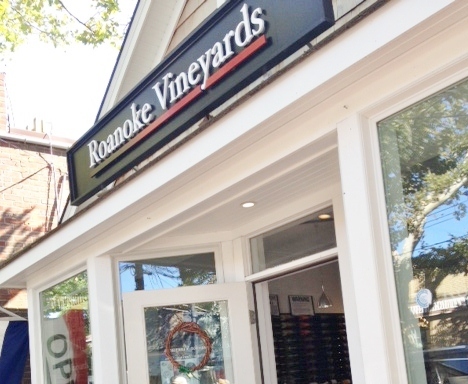 Normally, Roanoke features wine from Grapes of Roth and Wölffer Estates (on the South Fork) as well as their own, and they offer a menu of choices from each. I would have liked to taste some of the Wölffer wines, as it had been years since I’d tried them, but the only Wölffer selections on offer were hard ciders. However, once we realized we could do the Roanoke vs. BOE face-off, we knew what we had to do. For $20 we got to taste eight wines, four from each, paired for similarity of grape and type. I love tasting two wines made from the same grape, grown in the same region, and seeing how they differ. The Tasting Bar is a small storefront, augmented by tables on a petite patio in the back and some tables for two along the side of the building, and includes the tasting bar and some small tables and a few comfortable chairs where it would be nice to sit and sip a glass. As we tasted each selection, Robin and Alie alternated telling us about each wine, how it was made, and so on. Why “The Wild”? This is made with, said Robin, “indigenous yeast,” or in other words naturally occurring yeast, using chardonnay grapes from a Mudd vineyard which was originally planted in 1982. They’re not sure which clone it was, but it may have been a muscat, which would account for some of the sweetness in the wine. We detect an aroma of cedar shavings with tastes of pineapple and mango. It reminds me a bit of Channing Daughter’s L’Enfant Sauvage, which is also made with wild yeasts. Yum, in any event! I could happily sip this wine on the deck on a summer night. I guess this is paired with the wild because it is a similar weight white, but this is a blend of grapes from Upstate and the North Fork (Alie joked that she would love to have permission to plant vines in a park in Brooklyn, but that’s, alas, not likely.) 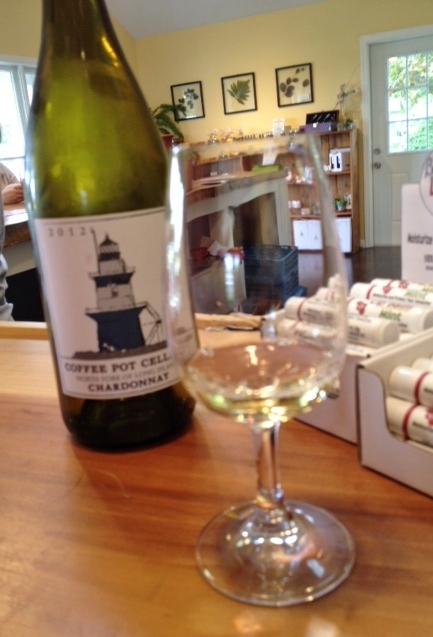 The blend is 60% chardonnay, with smaller amounts of pinot gris, pinot blanc, Vidal blanc, riesling, and gewürztraminer. I hadn’t heard of Vidal blanc before, and Alie noted that it is a Finger Lakes grape, as are the riesling and the gewürztraminer and the pinot gris. With all those Finger Lakes grapes I was expecting sweet, but this is a lovely dry wine with some citrus aromas and a bit of a taste of tangerine. Poetically, my husband compares the aroma to a “forest after the rain,” and I do agree that it has some flowery sweetness—in the taste as well as the aroma. It’s not a bad rosé, and many people would probably like it, but we prefer it drier. The name, by the way, is after the family’s Grandma Rose. I have to give the prize in this comparison to the BOE wine, which is made with wild yeast and uses Finger Lakes grapes. The color is very pretty, the aroma is very strawberry, and the taste is a bit reminiscent of a berry sorbet—so, too sweet for us, but more complex and interesting than the Roanoke. I admire the beautiful label, and Alie enthusiastically tells us that all her labels are designed by Brooklyn artists, with a special peel-off feature if you want to save the pretty pictures. This particular one was designed by Patricia Fabricant, and after they chose her design they learned that she is the daughter of Florence Fabricant, who writes about food and wine for The New York Times. We get fresh glasses for the reds, a nice touch. Their Bordeaux blend, this wine varies its composition from year to year, depending on the qualities of the grapes. This one is mainly merlot, and spends 10 months in neutral oak casks, then stainless steel. We smell cedar and berries, and taste blackberry. Though not a bad wine, it is a bit thin, and lacks depth. So I had to ask, “Why Social Club?” Alie explains that when she moved to Brooklyn (the winery’s tasting room is located in Williamsburg, of course) she noticed all the immigrant social clubs, and decided to name her wines for them. She liked the idea of wines that were casual and friendly. Also a Bordeaux blend, Alie’s wine is 77%merlot, 18%, cabernet sauvignon, and 5% Corot noir. Corot noir? The grape is a hybrid created at Cornell, and adds a dark color to the wine, without the use of chemicals. We like it very much, tasting plenty of fruit with a bit of side of the tongue sweetness yet dry at the end. 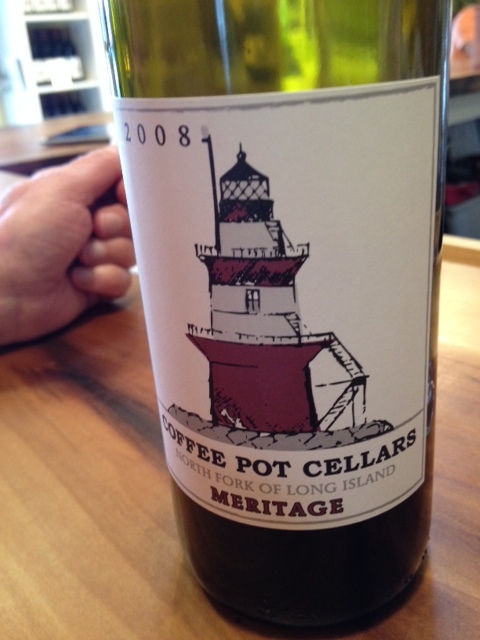 2010 was a great year on the North Fork, but we’re not crazy about this wine. We smell cinnamon, plus some of that local earthiness, and taste some fruit and some smoke. Perhaps it needs more time. Okay, same grape, same year, though BOE adds 4% petit verdot, sourced from Onabay’s vineyard in Cutchogue. Again, we smell cinnamon, some earthiness, but the taste differs. It has more fruit , a dry finish, and is softer, with no smoke. We like it! 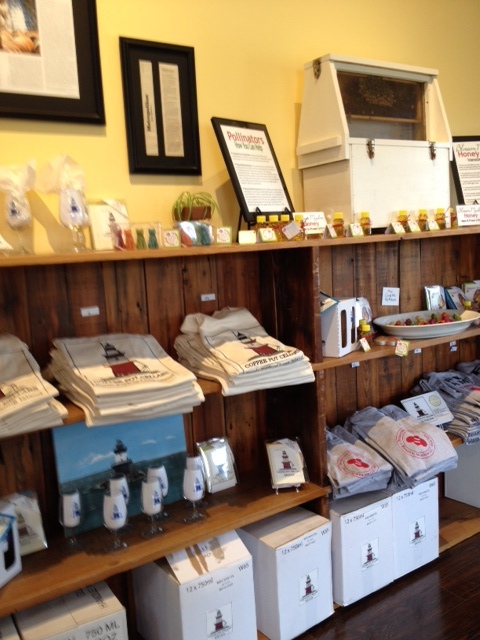 We buy a bottle each of the BOE Merlot and the RV The Wild and browse the small selection of gifts. They have the Govino glasses, which we have bought as gifts in the past. They’re a high quality plastic, nice on a picnic or a boat. Oh, and as to who won the face off? I’d have to say we did, because we got to sample wines from two wineries and only had to travel to one! 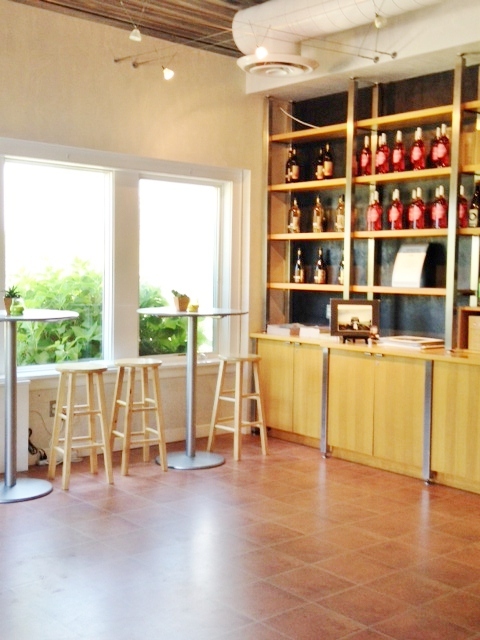 Reasons to visit: convenient tasting room in the middle of the North Fork on Love Lane, which is itself a destination with its cheese shop, Bookhampton book store, Love Lane Country Kitchen, and more; The Wild; the chance to taste wines from other vineyards as well. There are always changes out here in wine country. 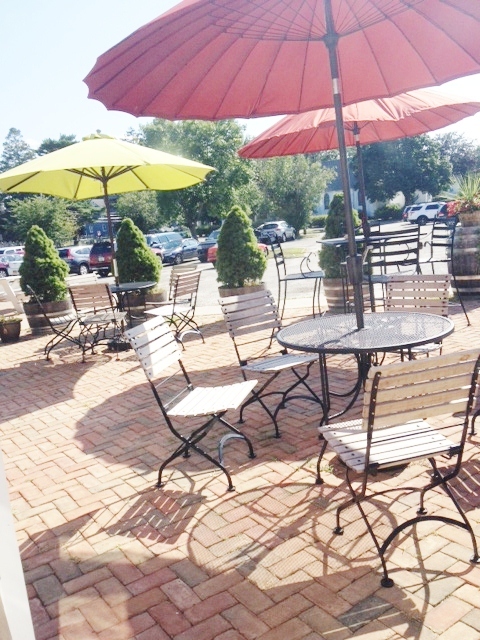 New wineries open, some close, others merge, and menus change with each new harvest. 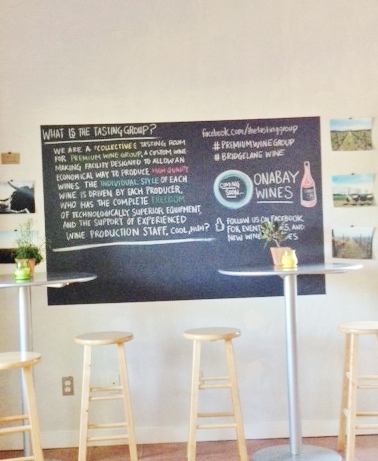 Lieb Cellars has made some alterations in their tasting room options. Their Oregon Road facility (see my entry from last August for a description of that tasting room) still has the full panoply of Lieb wines, while their Sound Avenue room has been re-named The Tasting Group and now offers two menus: Lieb’s Bridge Lane line (their less expensive offerings) or the “featured flight,” which features wines from a variety of labels which use the Premium Wine Group wine-making facilities behind the tasting room. Either flight includes some very good choices. 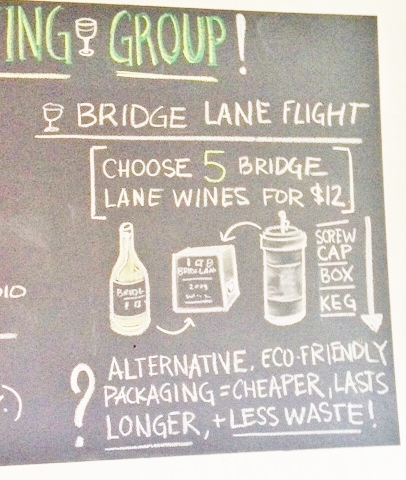 We opted to each get our own flight, sharing tastes as always, and I took the Bridge Lane option, which includes 5 tastes for $12 from the Bridge Lane menu. My husband took the featured flight, also 5 tastes, though with no options, for $14. We were accompanied by family members, with the three year old distraction and her two month old sister opting to spend their time outside at one of the picnic tables on the lawn, admiring the grapes and just generally running around. On Friday evenings Lieb has what they call “Firefly Fridays” out there, with music and glasses of wine on offer from 6-8 p.m. 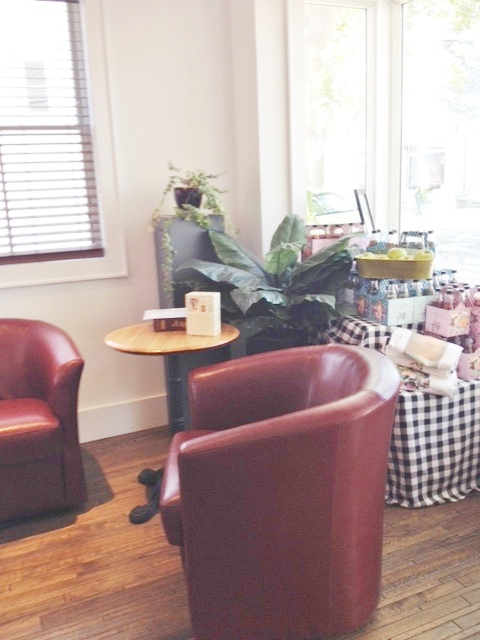 The room itself is a bit small and somewhat spare, with a tasting bar and a few small tables. Our server seemed quite knowledgeable and enthusiastic, and attempted to make a red wine convert out of another customer who kept insisting she only liked whites, though to no avail. I’ll give you the Bridge Lane wines first, then the others. 20% chardonnay, 20%pinot blanc, 18% Riesling, 14% Viognier, 9% sauvignon blanc and 4% gewürztraminer combine to make this a pleasantly fruity yet light white, with nice citrus flavors. Classic summer wine. 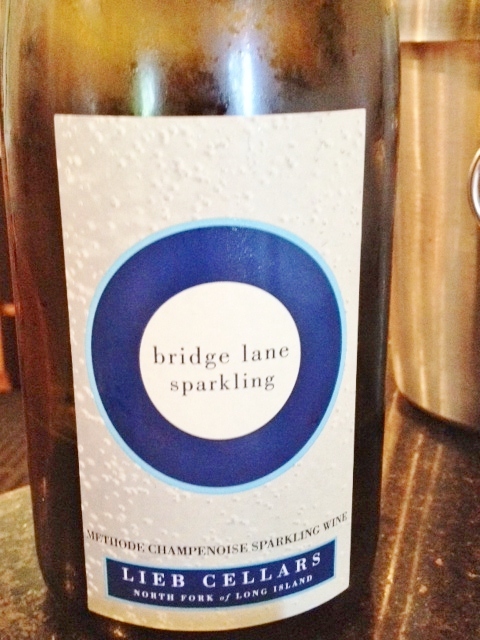 Very dry, somewhat mineral-y, and reminiscent of a Prosecco, this is a bit too seltzer-ish for me. I liked the bubbly label. Unoaked, our server notes, so a good choice for those who dislike the California style of heavily oaked chards. This is light and lemony and very buyable. Since we were just recently at Croteaux, of course I have to compare this to their wines, and it’s fine, but not as good. A blend of cabernet franc, merlot, and gewürztraminer, this has typical strawberry aroma and is pleasantly dry, but could use more complexity. Though this is called merlot, it is also 24% cabernet sauvignon and cabernet franc, grapes which I think always improve a merlot. For the price this is a really good option, with lots of berry flavors though not much aroma. Very buyable, which we do. Now for the Featured Flight. Perhaps you were wondering where in Brooklyn grapes are grown? 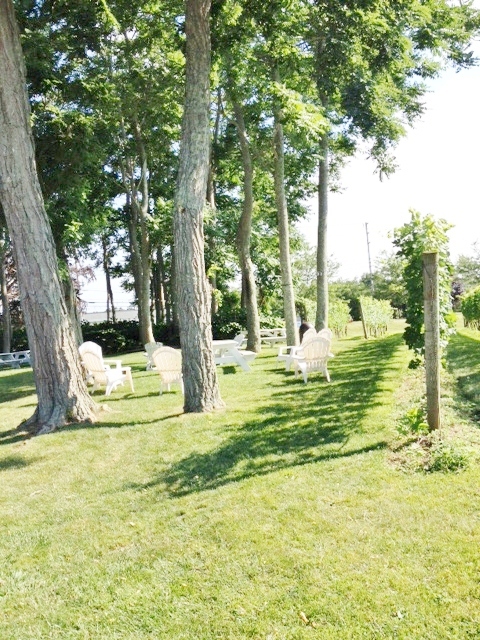 The grapes for this wine come from Upstate New York and are processed here in Mattituck. The wine is very, very dry, with lots of tart lemon flavors, so would be better with food than sipped on its own. The SUHRU Riesling got some favorable comments. We’ve encountered SUHRU wines before, in The Tasting Room (now under different ownership as The Winemaker’s Studio) so we knew that they are made by Russell Hearn, Lieb’s winemaker, and his wife. As the name promises, this is a dry Riesling. It has a touch of that cat pee smell, but tastes fine, with good fruit—maybe gooseberry? Our relatives really like it. “Not a lot of character,” offers our relative, and we agree, even though you’d think a blend of cabernet franc, cabernet sauvignon, and merlot would be more interesting. There’s a touch of that earthiness some North Fork merlots have in this dry rosé. Where did the name T’Jara come from? Our server tells us that this is Russell Hearn’s premium label, only made in good years, and, since he is from Australia, he decided to name it for an Australian tribe. Aged in oak, this is a very good merlot, with plenty of berry tastes, dry but not too dry. 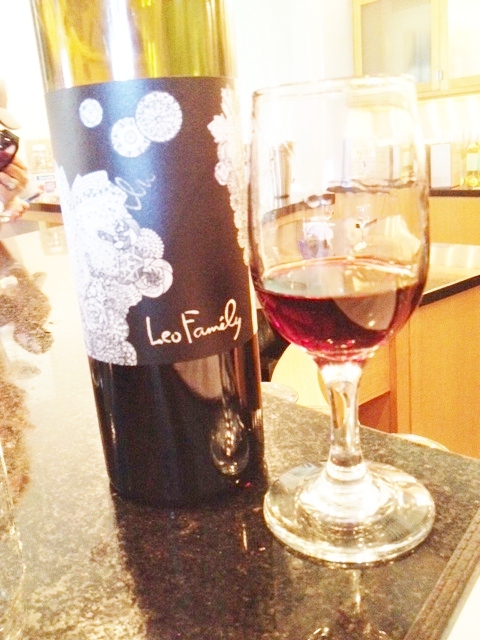 We liked Leo’s label–and wine. We liked this the best of the wines sampled today. A Bordeaux blend, this is a wine one could happily sip on its own or pair with pork chops. It’s a bit on the sweet and soft side, without a lot of tannins, made by the Clovis Point winemaker. It also has a really pretty lacy pattern on the label. In addition to bottles, one can also buy some of the wines in a box! A box of White Blend or Red Blend is the equivalent of 4 bottles, we are told, costs $46, and can last three weeks after being opened. 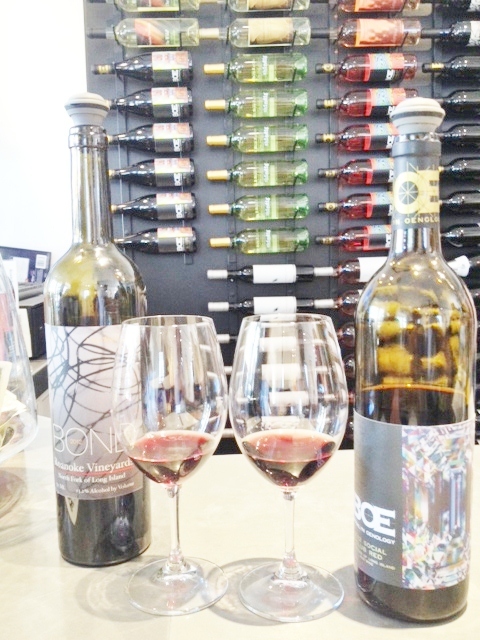 We opt instead for two bottles of the Bridge Lane merlot as an everyday table wine, our relative goes for the SUHRU Riesling, and one of our three tastings is complimentary. Reasons to Visit: the chance to try a variety of wines from various winemakers, in addition to Lieb’s own Bridge Lane line; the Bridge Lane chardonnay and merlot; the Leo Family Red Blend (If I were here for a Firefly Friday, I would get a glass of this if it were on offer. 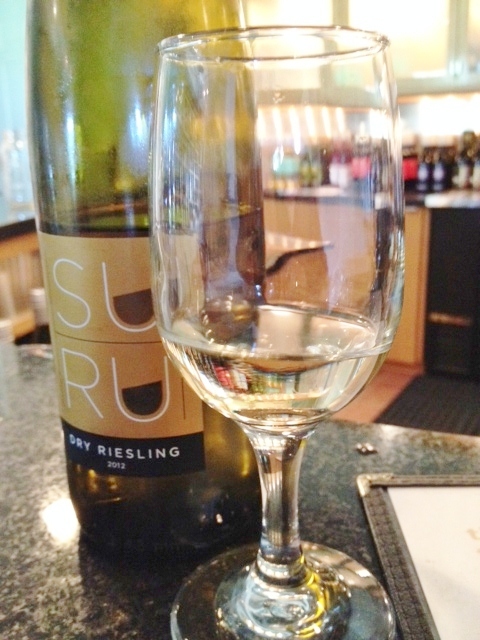 ); the SUHRU Riesling; a pleasant outdoor space for a glass and a picnic. We often see groups enjoying the Firefly Fridays, but have not had the chance to do so ourselves yet.